For the last few months, I've been getting 1.0Mpbs to a maximum of 1.8Mbps. The issue is, I am supposed to be getting 17Mbps (max), being on an ADSL2+ connection. I am located 100m away from the cabinet housing my individual connection. Fed up, I decided to move the router to the main hallway (where I am about a metre away from the router). I got an increase in D/L speed from 1.8 to 2-3.0 Mpbs, though it now varies between two and three, never more than three. I then decided to buy an 802.11ac router today, as my previous one, though ADSL2+ compliant was about 9 years old. The ac one ended up slowing me right down. (Think 0.8 Mbps) So, I went and bought a Spark modem. As I did before with the ac modem, I attempted to download some large files (in the order of 2GB), to check the D/L speed. It was still the same as before, with the same speed of 2-3Mbps. I have never, in the six years since rejoining Spark (2009), ever attained double digit Mbps (i.e. 10.0+). I am in Central Auckland. I did, once I setup the Spark router, I ran a Spark speedtest, getting between 13 and 14 Mbps. This was slightly higher when connected by RJ-45 to the router, and again, slightly slower, when run via wifi (Yes, I do understand why it will be slower). I have been on the phone (spent hours waiting) to Spark all day, and they wanted me to run a speedtest, but due to the ac modem having (back then) degraded the connection so much, the speedtest didn't even load. The thing is, I consider the Spark test misleading, as it says I have 13-14 Mbps D/L, but I fail to understand why I (still) only get 3.0 Mbps, even with the Spark modem. I am worried that the helpdesk will take a look at it, say "all is fine", and then consider it closed (hence the "misleading" part). I have been told by the helpdesk my line is physically OK.
Could someone from Spark who occasionally pops their head in, please help out? where are you getting these slow download speeds? Can you point me to where I can find the needed stats from the modem, please? You are not confusing bits and bytes are you? Speed test will be measuring in Mbit/s while your download manager likely reports Mbyte/s. Also if you are able to elaborate on how you have determined the "1.8 to 2-3.0 Mbps" what sites are you getting these speeds for? Tests are done on RJ-45 first, then Wi-Fi. Ethernet results are the ones I use. No large files are downloaded when I carry out my tests connected by RJ-45 to the router. I have done this by downloading updates via Apple, and watching the D/L rate. I have also checked my PS4's stats, which is connected via RJ-45. However, it was only there for about 20-30 seconda, before dropping to 1.5 (this was being directly connected to the router via RJ-45). This was not via the Spark modem, but the 9 year old one mentioned in the beginning. Last night, before I bought the "ac" router, or the Spark one being used now, I moved the router, and they picked up from 1.0Mbps to 2-3.0Mpbs (wavering), once it was moved. if you are getting 13-14mbps to the spark speed test server, try the vodafone one and the likes of yes optus in sydney, if you still get 13-14mbps then the issue is inside your network and its got nothing to do with spark. its possibly how you have configured your network. if its downloading at 2MB/s thats pretty much full speed for your connection and if it drops to 1.5MB/s there is still nothing to complain about, and the issue could be outside of sparks network, in one of the overseas networks that the data has to go through. its unlikely you will ever get full speed downloading anything from the US or even anywhere overseas for that matter, its just the nature of the technology we use. Confused as to what you're actually expecting? Yes, everything does appear to be working as expected. 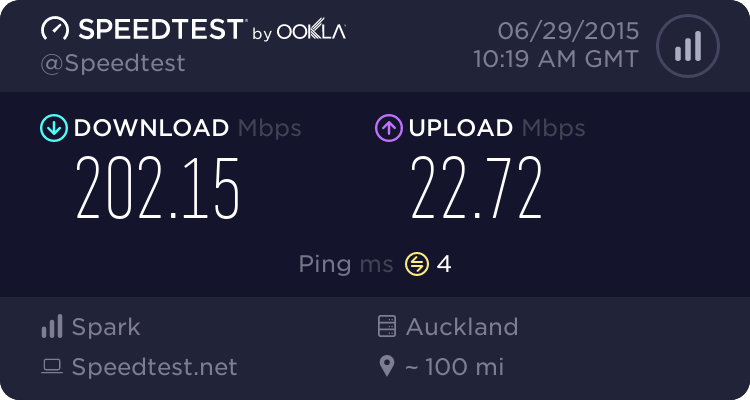 I was expecting faster speeds, but it has just occurred to me that I got myself mixed up with Mbps and MBs, which was why I was expecting faster speeds. Thanks for taking the time to post, it is appreciated. Also with those stats, you can probably get VDSL. Yeah with those stats I'd at least expect 45mbps+ dl out of VDSL with those stats. It's really worth it if you love huge amounts of media consumption.